Roberto Firmino had a fine afternoon scoring a brace. Liverpool beat Burnley 4-2 at Anfield, to keep pace with the league leaders Manchester City. The match could not have started on a more disastrous note for the hosts after they fell behind from a lucky goal by Ashley Westwood in the sixth minute. 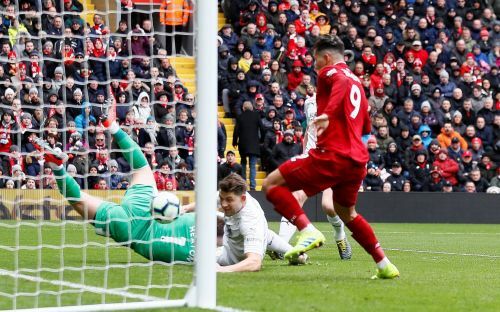 There was clearly a foul on Alisson, by Burnley defender James Tarkowski, but the referee missed it and the Liverpool goalkeeper was instead booked for dissent as the goal stood. Roberto Firmino equalized for the Reds in the 19th minute, after some nice one-two play by Gini Wijnaldum and Mohamed Salah. Salah fed the ball into the middle, that caught Heaton and Tarkowski unawares, leaving Firmino with a nice tap-in. Liverpool took the lead in the 30th minute of the match. Adam Lallana deserves all the credit for the goal, as he made an excellent defensive block on a Burnley clearance. The resultant block fell to Salah, who was fouled in the box but Mane was on hand to score a fine goal, a curling volley into the top-right corner. Both teams went into the break with the score reading 2-1 to the hosts. After the break, Liverpool were in the ascendency and apart from a few minor chances, Burnley did not really trouble the Reds. Firmino added his second, and the Reds their third, in the 68th minute after a horrendous goal kick by Heaton found Salah. Though Salah got blocked, the loose ball found its way to the Brazilian who calmly slotted the ball into the back of the net. Sadio Mane and Mohamed Salah both had chances towards the fag end of the match, but they didn't trouble the scoreboard. Burnley did reduce the deficit in injury time to cause jitters in the Reds camp. Gudmundsson scored for the visitors in the 92nd minute, but Mane put the match to bed by scoring in the 94th minute to secure three points. This was exactly the kind of performance Liverpool needed after some poor results in the past few weeks resulted in them losing a 7 point lead to Manchester City in the Premier League title race. Liverpool next face Bayern Munich in the Champions League round of 16-second leg.